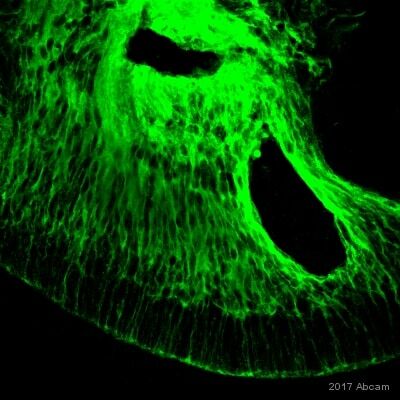 This antibody gave a positive signal in the following tissue lysates: rat eye; rat retina. Our Abpromise guarantee covers the use of ab15051 in the following tested applications. WB Use a concentration of 1 µg/ml. Detects a band of approximately 35 kDa (predicted molecular weight: 36 kDa). Soluble retinoid carrier essential the proper function of both rod and cone photoreceptors. Participates in the regeneration of active 11-cis-retinol and 11-cis-retinaldehyde, from the inactive 11-trans products of the rhodopsin photocycle and in the de novo synthesis of these retinoids from 11-trans metabolic precursors. The cycling of retinoids between photoreceptor and adjacent pigment epithelium cells is known as the 'visual cycle'. Retina and pineal gland. Not present in photoreceptor cells but is expressed abundantly in the adjacent retinal pigment epithelium (RPE) and in the Mueller glial cells of the retina. Defects in RLBP1 are a cause of retinitis pigmentosa autosomal recessive (ARRP) [MIM:268000]. 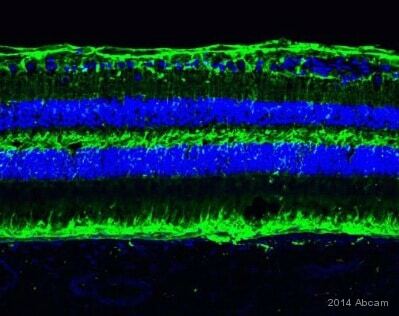 RP leads to degeneration of retinal photoreceptor cells. Patients typically have night vision blindness and loss of midperipheral visual field. As their condition progresses, they lose their far peripheral visual field and eventually central vision as well. Defects in RLBP1 are the cause of Bothnia retinal dystrophy (BRD) [MIM:607475]; also known as Vasterbotten dystrophy. Affected individuals show night blindness from early childhood with features consistent with retinitis punctata albescens and macular degeneration. Defects in RLBP1 are the cause of rod-cone dystrophy Newfoundland (NFRCD) [MIM:607476]. NFRCD is a retinal dystrophy reminiscent of retinitis punctata albescens but with a substantially lower age at onset and more-rapid and distinctive progression. Rod-cone dystrophies results from initial loss of rod photoreceptors, later followed by cone photoreceptors loss. Defects in RLBP1 are a cause of fundus albipunctatus (FA) [MIM:136880]. FA is a rare form of stationary night blindness characterized by a delay in the regeneration of cone and rod photopigments. Immunocytochemistry/ Immunofluorescence - Anti-CRALBP antibody [B2] (ab15051)Image from Subrizi A et al., Biomaterials 33 (2012) 8047e8054, 11 August 2012. Fig 4.; doi: 10.1016/j.biomaterials.2012.07.033. Epub 2012 Aug 11, with permission from Elsevier. 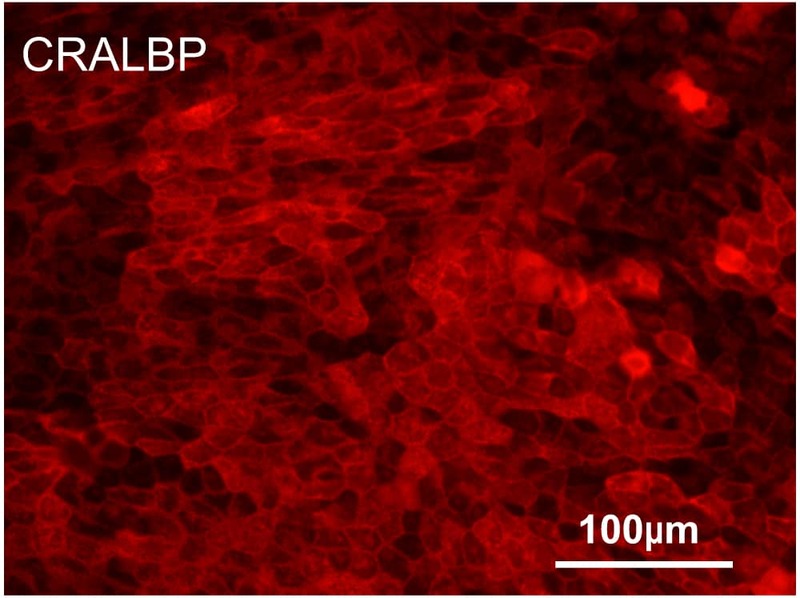 Immunofluorescence analysis of hESC-RPE monolayers, staining CRALBP (green) with ab15051. Cells were fixed with 4% paraformaldehyde, permeabilized with 0.1% Triton X-100 and blocked with 3% BSA for 1 hour. Cells were incubated with primary antibody (1/1000) for 1 hour at room temperature. An AlexaFluor®488-conjugated donkey anti-mouse IgG (1/800) was used as the secondary antibody. 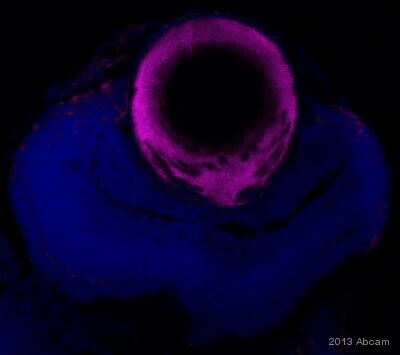 ab15051 staining rat retina sections by IHC-P. The tissue was fixed with formaldehyde and a heat mediated antigen retrival step was performed with citric acid pH 6. Blocking of the sample was done with 1% BSA for 10 minutes at 21°C, followed by staining with ab15051 at 1/250 in TBS/BSA/azide for 2h at 21°C. 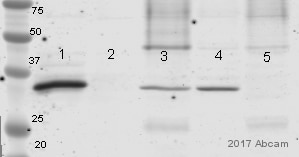 A biotinylated goat anti-mouse polyclonal antibody at 1/250 was used as the secondary antibody. Müller cells in the eye retina are positive. Two different areas of the retina are shown. Publishing research using ab15051? Please let us know so that we can cite the reference in this datasheet. Actually, I look on your website and i did not see other CRALBP antibody suitable for IHC-P Therefore, I would ask for another CRALBP, the same reference that I already used, but another batch. Could you tell me when I can expect the delivery of it? As requested, I have issued a free of charge replacement with the order number XXXXX for the antibody ab15051 from a different lot to the last one received. To check the status of the order please contact our Customer Service team and reference this number. You will soon receive a confirmation informing about the delivery date. I hope this new vial works as expected. Please do not hesitate to contact us if you need any more advice or information.